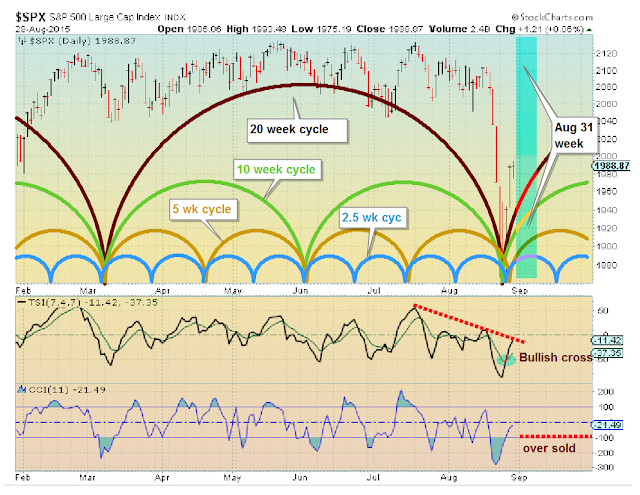 Short term cycles (20 week or shorter) are up for the week. The 2.5 week cycle should top by late week (Thur/Fri). The longer cycles (Shemitah -7 years, Kitchin - 3 1/2 years, 1/3 Kitchin - 13 1/2+ months ) are down so this should limit the upside to 2040 or less. Longer cycles continue to control market - down side bias.